This spiced pineaple drink, called chicha de piña in Ecuador, is a delicious way to use the leftover pineapple skins and core. 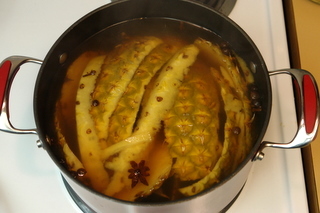 I’ve been working on some pineapple recipes lately (recipes coming soon), but one of my favorite parts of cooking with pineapple or just eating a pineapple is using the pineapple skins and the core – which most people usually throw away – and boiling them with water, panela and spices to make pineapple chicha or a spiced pineapple drink. 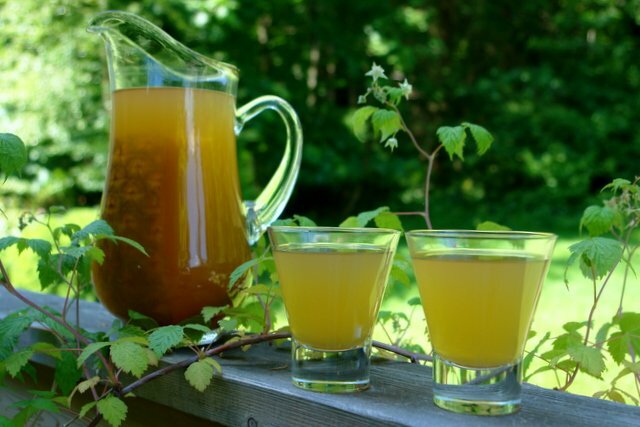 Traditional chicha is a fermented drink that is typically made from corn, sometimes also from yuca or cassava root, rice, oats, among others, but there are other lighter and easier to make versions of chicha. 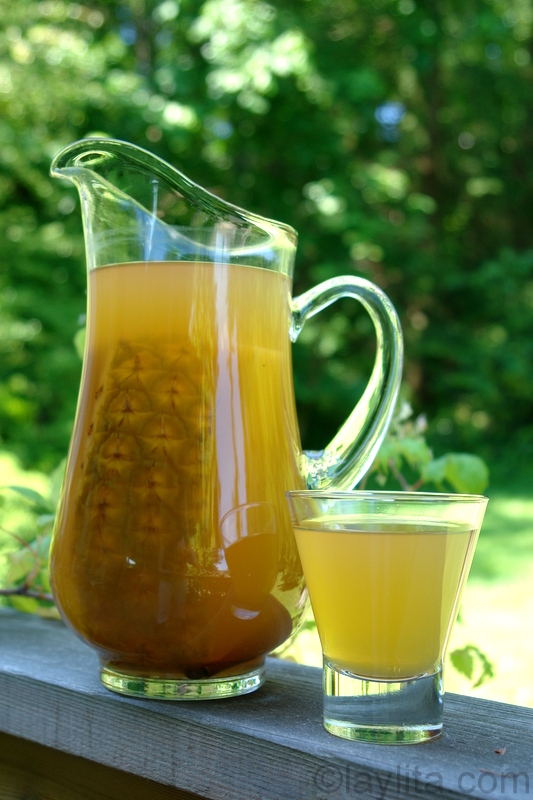 Chicha de piña is a spiced pineapple drink made by simmering the pineapple skins and core with hard brown sugar and spices. Bring to a boil and simmer partially covered for at about an hour, stirring occasionally. Let cool down, unless you are drinking it warm or hot, you can drink it immediately or let it rest refrigerated to allow the spices and pineapple flavor to concentrate. If you want to make the fermented version of chicha de piña, prepare the chicha by only boiling half of the pineapple skins with the panela and the spices, then mix this with the remaining raw pineapple skins and core. Let it rest – covered and in a clay pot if you have one – at room temperature (in a cool place) for a day or two or until it starts to ferment, then strain and refrigerate. My mom would make this drink for us whenever we had a pineapple, we loved it and would drink it pretty quickly, which meant it never really got to the true fermentation point, and while most traditional chichas are fermented – you can easily distinguish that spiciness that the fermentation adds to the drink – there are a lot of drinks in Ecuador that we call chicha but are much lighter versions that are freshly made and not fermented at all or just barely fermented. The true traditional chicha is made by chewing the corn and then spitting it back into a clay pot, spices and panela are also added, as a kid (ok and as an adult too) I thought that was just gross, most chichas you drink in Ecuador are not made this way anymore, the modern method is to grind the dried corn kernels with a rock (a somewhat primitive mortar and pestle), though if you really want to you can probably find a place to experience the “true” chicha. 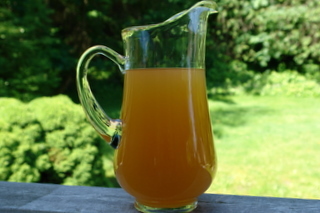 This pineapple drink is sweetened with a hard brown cane sugar called panela, also known as piloncillo or panocha; it comes in a brick or cone shape and can be found in most Latin grocery stores or even in certain mainstream grocery stores. Panela is made directly from sugar cane juice, most of the panela you find in the US imported from Colombia and is probably produced in a more industrial setting; however in the town where I grew up in Ecuador the process is it a little bit more old-fashioned, the panela is prepared in trapiches, which are a very rustic processing area. There were a few trapiches close to our farm, where we had a small field of sugar cane and when ready to harvest, the canes were cut with machetes (the bases are left and grow back), then the sugar cane was loaded unto donkeys – which were wearing these special wood devices to carry the sugar cane-, next the sugar cane was taken to the nearest trapiche, where it first goes through a press that squeezes the juice out. The juice, which is called guarapo and is delicious mixed with bitter orange juice, is then cooked in these large rectangular metal devices (that have fires going underneath) and stirred with these huge wooden spoons (that almost look like kayaking paddles), it goes through several different of these cooking stages until at the end you have a very thick syrup, which is then poured into small brick shape wood molds, once the panela dries it hardens and the molds are removed.It is a very interesting process and just the trapiche part takes about an entire day, and of course as a kid it was great fun to drink some guarapo and taste the cane juice syrup. 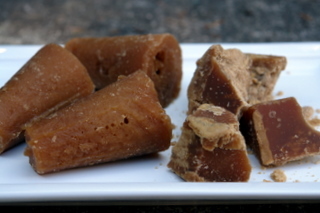 In Ecuador we use panela as most people would use sugar: to sweeten coffee, tea, juice, to bake and to make marmalades or fruit preserves; the panelas are kept in their hard brick form until ready to use and then they are melted down with water to make a syrup called miel de panela (panela honey) which is used to sweeten things, or it is also grated when used in certain dishes or for baking. My recipe for chicha de piña does not cause the drink to ferment, though you can keep it for several days in the fridge, with the skins and spices in the drink, and it just gets better and better. If you do want it to ferment a little you can prepare the chicha by only boiling half of the pineapple skins with the panela and the spices, then mix this with the remaining raw pineapple skins and core, let it sit covered at room temperature (assuming room temperature is about 60 F) for day, and don’t refrigerate until it starts to ferment (obviously if it starts to rot or mold you shouldn’t drink it).Most of the time this pineapple chicha is served chilled – very refreshing on a warm day – but I also love to drink it hot, especially on a cold day, it’s almost like a variation of spiced apple cider. In fact, as far as spices go you can use a similar mix to what you would use to make spiced cider or mulled wine (a good way to use those spices up if you still have any leftover from winter), you’re entire house will smell so good when you are making this drink! You can strain it if you are drinking it immediately or leave some of the skins and spices in the drink. I’m glad to be able to use pineapple skins, not waste! Tastes wonderful! My hubby and I like it. Thanks for the recipe! My kids did a geography fair and their country was Ecuador. 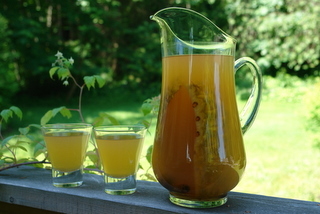 We made this drink to share and it was a huge hit and will become a staple in our house. 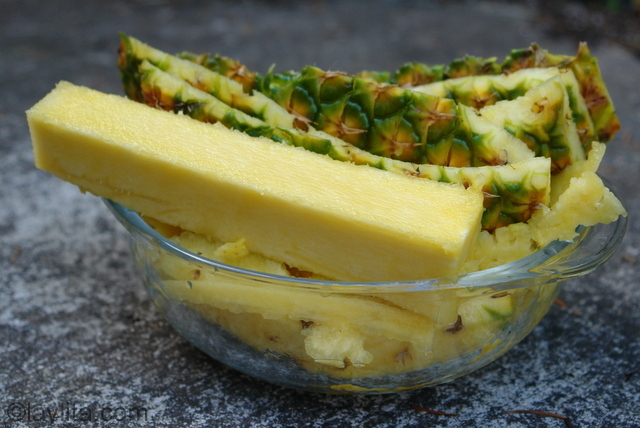 What a great way to use the entire pineapple. Thanks again for sharing this great recipe! 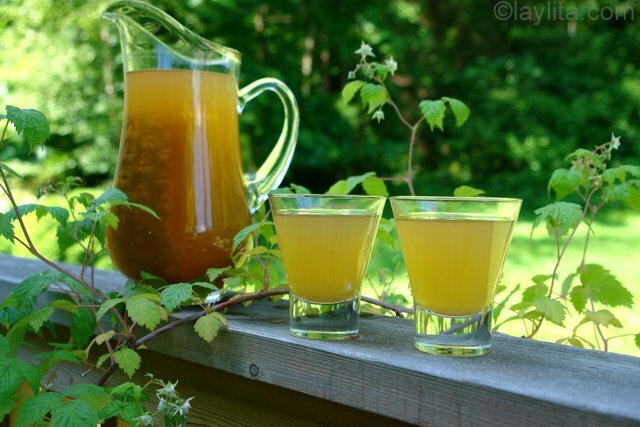 In Haiti we call this drink “Godrin” and I am surprised to hear that many other cultures have the same or similiar drink. 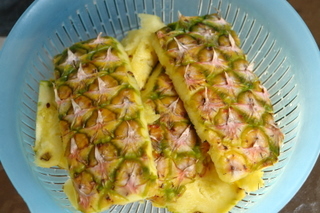 We make ours by letting the pineapple skin and the pineapple eyes (that my father would patiently cut from the pineapple meat )sit in a jug of water, well covered for about 3 to 5 days shaking it daily. The fermented mixtured is then strained. Sugar and vanilla extract are added for a refreshing drink . Note of caution: I prepared a gallon jug before leaving town for a few days thinking it would be ready to strain on my return but I completely forgot about it. I remembered about it 2 weeks later. Luckily I had a strong screw cap on it, but due to the pressure in the jug I was unable to remove the cap. Using a plier I slowly tried unscrewing it when the cap shot up hitting the ceiling, and the Godrin gushed out like a volcano. I had half a jug of wonderful Godrin left and a dented ceiling. I’ve had chicha the traditional way, while training with the Ecuadorian Army. Their method though was masticated yuca plant, not corn. Is this a traditional drink as well, or is it supposed to be made with corn? According to them it had to be chewed by the indigenous as well. Personally, I think I would much prefer this drink! Hola, que emocion, encontrar esta receta que hace muchos años atras mi padre que es de origen Ecuatoriano me enseño a prepararla y se me habia olvidado un poco. Estoy contenta por tu pagina, me encanta cocinar al estilo pasado, tomandome mi tiempo y con productos naturales, y me da gusto encontrar a alguien que me inspire a cocinar dia con dia . Muchas Gracias. This sounds similar to Mexican Tepache! 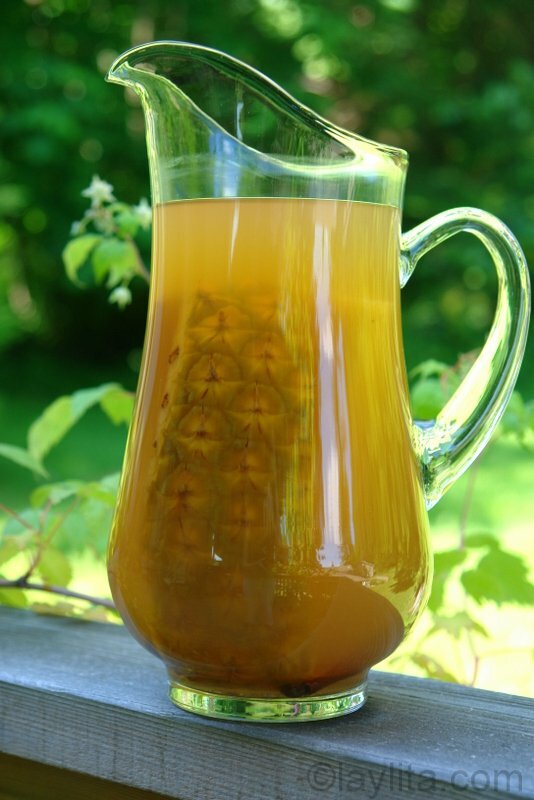 Growing up in The Dominican Republic my mother will use the pineapple skin to make “jugo de pina” set the skins and core in water let it ferment in the refrigerator for a few days, then she would strain the “juice” and add sugar to taste, it was so refreshing. I will try to make yours it looks so tasty! Thank you for a recipe to use the pineapple peelings and cores. 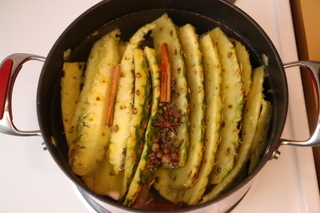 I am making pineapple spread (butter) and made your recipe with the peels and cores and enjoyed it warm. I look forward to trying it chilled for breakfast tomorrow morning. Did you ever get the mango recipe, it sounded very good. Thanks again, and thanks for expanding my food horizons to Ecuador! 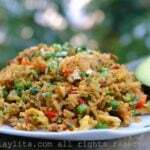 Growing up in El Salvador, my grandmother would make Pinaple Chicha. I don’t ever remember putting anything else in it other than the peelings and water. And letting sit on a cupboard for a bout a week in a cupboard. One the stink started to escape, we knew it was almost ready hahaha. I loved the stuff, I would get drunk off it, it was great. Though things may have been a bit more liberal back in the day, i think I’ll stick to the your non alcoholic version as a way to introduce my kids to it hahahaha thanks. You are great! Sharing your recipes and tidbits of your life! I left Ecuador in the 70’s. You are my fresh memory now. Thanks. 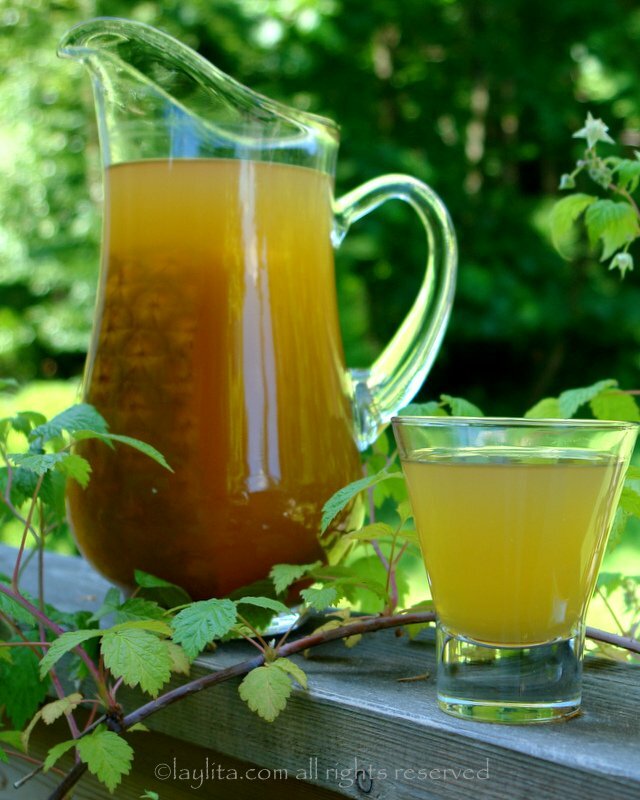 I was born in Colombia and I remember having Chicha either as a non-alcoholic drink or very well fermented as an alcoholic drink. I am so happy to find this recipe. I’ve been in the States for more than 20 years and I have never have Chicha here. So I’m on my way to buy some pineapple and make Chicha. This would be Chicha made in the USA. I am surprised that your mother didn’t make colada de avena (an oatmeal drink with both naranjillas/lulos AND pineapple skins and cores). Most people in Ecuador do! I am excited to see so many people interested in Ecuadorian recipes. Our food here is the best! A few old copies of my book (in Spanish, but with English/French/German glossaries) can be found on Amazon.com. Delicious Andean eating to you all! Hi Michelle – Thank you for your comment, I’ll mention to the readers on my spanish site that they can find your book on your site. Also, my mom did make colada de avena, just not with the pineapple skins, she only made it with naranjilla, and we drank it pretty much every day. The pineapple skins were always used to make this pineapple drink. I would like to give this a shot! Sounds delicious! 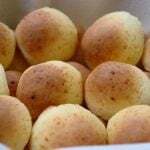 If I were to use cinnamon and cloves, according to the recipe above, how many cinnamon sticks and how many cloves would I need to use. Also, has anyone ever tried making this with ginger root? For this recipe I used 4 cinammon sticks, a couple of cloves, as well as an anise star and some all spice seeds. 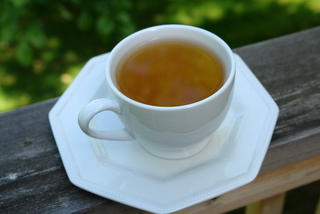 I haven’t tried it with ginger, though I love having a cup of ginger lemon tea with honey. I made this drink and it was ridiculously easy to make. But, I didn’t like it…I’m sorry. I think it needs an acquired taste. Even my husband wouldn’t touch it. But I am sure people who are accustomed to the taste will really enjoy it. 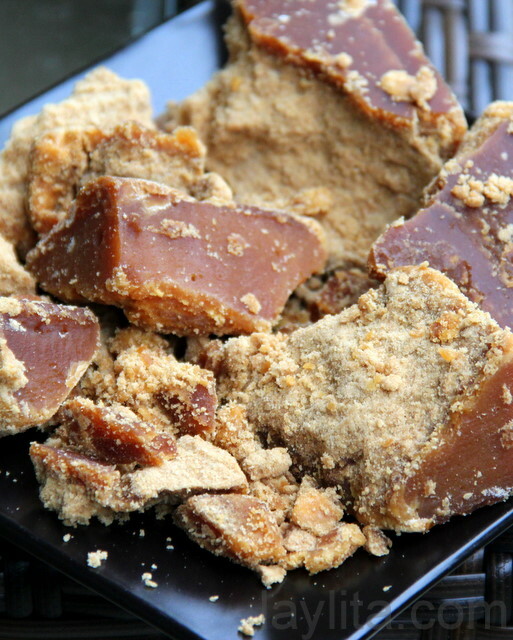 P.S: I made it with indian palm sugar which is also moulded in the same shape as panela. in this country people just throw away skin off of most of the fruit, but this is a reminder that skin and “guts” have a lot to offer. We will be in Mexico all winter so I will try an make this drink there, fermentation will happen faster there than here in Seattle…. thanks for sharing! “I’ve heard of colada or quaker being made with the pineapple skins but I haven’t ever tasted it”… really??? Next time you and I are in Ecuador I will ask my mom to make for you… quaker or any kind of colada with pine apple or with naranjilla or with both is delicious!!! MPG – Your mango drink sounds very interesting, I definitely want to try it, let me know when you post it. Sounds really yummy! Amazing how many similarities food and cultures across the world have. We use a similar sugar, gud in India and have substituted panela when we could not find it out here. This drink is also very similar to a mango drink I grew up drinking in summer (and yes they did not let any part of it go to waste! :) I plan to post it if I can find the right kind of mangoes soon! Hi Melissa, as a kid I always wanted to eat the core, but my mom wouldn’t let me, she said it would make my stomach hurt, regardless I would eat still eat some of it and even now I still do, the core is also really good to eat when you’re done making this drink, it has all of the flavor of the cinnamon and other spices. Try crunching on a bit of the core next time you get a pineapple (we eat it in long, triangular sticks like in the second photo)! Paulj- I just realized that the cookbook you mentioned is actually in Spanish and also that my mom has it (and it is on my list of things to “borrow” next time I go to Ecuador! i always feel terrible throwing so much of the pineapple away, especially since i don’t have a composter and it just goes into the garbage. but i will feel guilty no more thanks to this recipe! Hi Paulj – I’ve heard of colada or quaker being made with the pineapple skins but I haven’t ever tasted it, I make the oatmeal colada (recipe and photos coming soon) with a fruit called naranajilla or lulo. I’ll have to try to find the cookbook you mention, it’s almost impossible to find Ecuadorian cookbooks (in English). The cookbook by Michelle O. 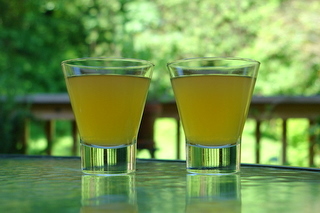 Fried (Comidas del Ecuador) has a recipe for ‘Quaker’ that is essentially this pineapple drink plus rolled oats.